While working on an archival project for MX Sports, I stumbled across a cool database, courtesy of our friends at the AMA. The (paper) file contained copies of every AMA national-number memo. These documents announced the lucky ninety-nine riders who earned a two-digit national number for the following season. 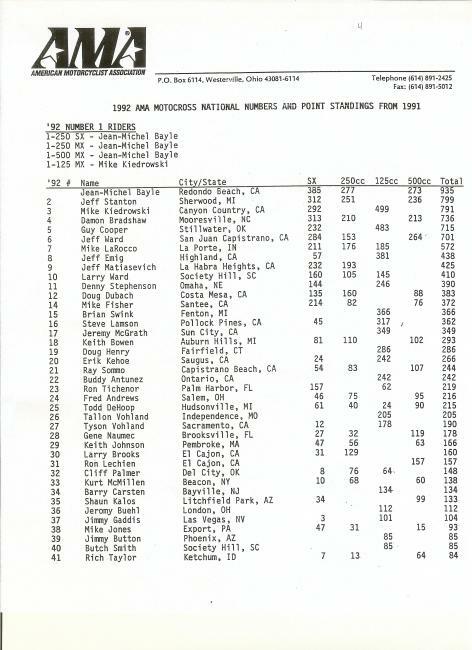 The file went all the way back to 1974, the first year the AMA assigned numbers based on overall points ranking. While looking through all the paperwork, I couldn’t help but become lost in the names, numbers, and various other details of the data. So this week, we’re going to be looking at things a little differently. Instead of focusing on one rider, we will take a look at the top ninety-nine riders for 1992 (and one race official). These are the riders who scored points during the 1991 season and thus earned a coveted two-digit number for the following 1992 racing season. Before diving into the documents, let’s establish something: Earning a two-digit national motocross number is badass. In my book, any racer who scores enough points at a national or supercross to earn a two-digit number has achieved a significant racing accomplishment and deserves recognition. The number of local racers who make up the bottom fifty of the numbers is always significant, and these guys spend a ton money, time, and effort just to earn a few points—and perhaps some bragging rights. So what did we find in our AMA memo, dated October 21, 1991? Jean-Michele Bayle won three championships in 1991 and thus earned the coveted blue #1 plate (blue for Camel Cigarettes) for supercross, as well as the #1 plate for both 250cc and 500cc outdoor series. Back in 1991, this was perhaps one of the most significant accomplishments a rider could achieve, and Bayle firmly asserted himself as the best rider in the world. 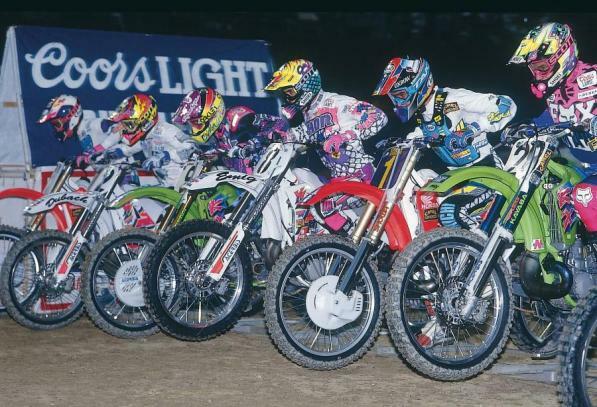 In fact, the only other rider who was able to win the supercross, 250, and 500 outdoor championships was Jeff Ward, but he did it over multiple seasons. JMB won all three in one year, established himself as the best motocross racer in the world, and then promptly walked away to go road racing. The next thing I noticed was something that was missing – the Inland Empire. Not one rider in the top ninety-nine listed today’s motocross hot spots of Corona, Temecula, or Murrieta, California, as home. Even Jeremy McGrath, sporting the big #17, listed nearby Sun City as his hometown. Perhaps Jeremy moved to Murrieta shortly thereafter and started the whole address craze? The next thing that stood out was the Vohland brothers: Tallon (#26) and Tyson (#27) somehow earned consecutive national numbers. What are the odds of that? (And I am not talking about the Alessis with their 800 and 801, as those numbers were chosen.) Tyson was the older brother, so he couldn’t have been happy that his younger brother scored the lower digit! Today, Tallon works for Scott goggles and can still be seen at the races on a regular basis. While looking at the Vohlands’ points and numbers, I also noticed they had listed separate hometowns. Tallon listed Independence, Missouri, while Tyson had Sacramento. Upon further investigation, I noticed that a number of California riders had strange East Coast locations listed as home. For example, SoCal’s Ryan Hughes (#68) listed Shelby, North Carolina, while NorCal fast guys Jeff Pestana (#67) and Chris Neal (#74) allegedly hailed from Lacrosse, Wisconsin, and Axton, Virginia, respectively. Today, both Ryan Hughes and Jeff Pestana are motocross trainers and still ride regularly. Pestana also has a lucrative job doing long-term testing with American Honda and makes frequent trips to Japan to test top-secret new Honda models. And one final note on geography. There were three riders who were keeping it real - and representing the original motocross hot bed known as “The Zone” - the El Cajon zone. Those guys were none other than Larry Brooks (#30), Ron Lechien (#31), and Michael Craig (#59). Brooks went on to become one of the most successful supercross team managers (and currently is on strange “family leave” from Team San Manuel Yamaha). Lechien retired and is now working alongside his father at Maxima Lubricants in San Diego, and Michael Craig (#59) is busy raising a second-generation racer, team TLD rider Christian Craig. The 1992 season was one to remeber. Looking down the list, Kurt McMillen earned a very respectable #33. McMillen hailed from the Hudson Valley of New York and was known as a 500cc specialist, along with guys like Dag Boyesen (#45) and Tommy Carson (#51). Today, McMillen runs a family plumbing business and is still active in the local and regional racing scene in the Northeast – and is still very fast. Dag Boyesen works for his family business in Pennsylvania, while Carson still attends the races, working with the Asterisk Mobile Medical crew. Next up on the list was Jeromy Buehl (#36) from London, Ohio. Buehl was an up-and-coming rider with Mitch Payton’s upstart Pro Circuit team, alongside McGrath, Steve Lamson, and Brian Swink. Unfortunately for Buehl, the AMA had tight advancement rules in the 125cc class, and after a few top finishes he was forced to move to the 250 class, where he faced a string of injuries and a lack of good support, despite being a top-ten rider. Buehl went onto race arenacross for a few years and is now retired and living in Ohio and, according to Ohio guy Rupert X, runs a landscaping business. Moving down, I came across another rider who had quite a bit of hype as a youth but never seemed to fully make the transition from prospect to pro. Butch Smith (wearing the #40) was rumored to be Bob Hannah’s protégé, and originally hailed from Idaho. Smith listed Society Hill, South Carolina, as his home, but he was likely working the system and so he could ride the Eastern Region 125cc Supercross class. Ty Davis (#49), Rodney Smith (#50), and a young Mike Brown (#54) all scored enough points to earn solid national numbers in 1992. Each also extended their racing days by switching over to off-road racing and finding some significant success, each earning a few championships along the way. Eighties legend and the original “Bad Boy,” Rick Johnson, earned #55 but had already retired (after a few brief supercross races) and never wore the number in competition. Rumor had it RJ had a clause in his contract that he had to race a certain amount of events in order to get paid, and he did exactly the amount needed before hanging it up due to complications with his wrist, which he first broke in 1989. 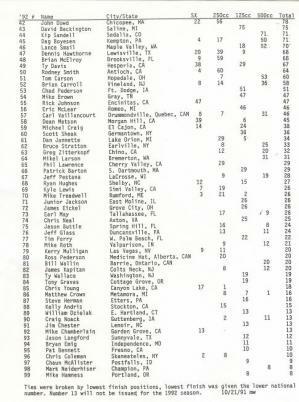 Ricky Carmichael’s training partner Earl May (#73) popped up on the list too. Earl is still going fast today. He makes his regular appearance at Loretta Lynn’s, while working a number of his entrepreneurial projects in the Tallahassee area. Last I heard, he and Ricky owned some automated car washes in the Florida Panhandle. Timmy Ferry popped up next (#77) and earned the first national number of his career. Ferry is now retired and works as a riding coach for Trey Canard. Ferry scored 22 points in the 125cc class riding a privateer Kawasaki supported by Mike Rossini of RRP. With a tip of the hat to Steve Matthes, Canadian rider Ross Pederson scored #80. With Ferry and Rollerball only separated by three degrees, I’m sure Steve wants autographed copies of these memos. Wearing the #94 was Bryan Emig. Jeff’s older brother was a pretty fast racer as well, as proven by the fact that he earned a two-digit number. That also makes two sets of brothers within the top ninety-nine in 1992. Closing out the list with the elusive #99 was Mike Hamness of Portland, Oregon. Frankly, we don’t know much about Mike, but if you do, let us know! Today’s system is similar, but with certain lower numbers locked in as “career” numbers, riders are no longer ranked directly as 2-99. Wondering about a certain rider, or know how to get a hold of someone who dropped off the scene? Drop me a line at nick@mxsports.com.